It’s one of the things we’re asked the most: How can I take care of my baby’s oral health before their first tooth even appears? There are lots of decisions and preparations to be made before your little one starts growing a mouthful of happy, healthy teeth. Many parents know they want to prevent cavities, but they aren’t always sure of the best method. And, in light of the recent FDA warning about teething medication, we think it’s a great time to brush up on some of the basics when it comes to taking care of your infant’s oral health. With the first signs of little teeth as they break through the gums (and the sad cries of the small baby warrior making those things grow), many parents might reach for a pain remedy containing benzocaine to help sooth sore gums. Please…Put. That. Down. The FDA recently reissued a warning that the use of gels containing this ingredient can lead to a rare, but serious—and sometimes fatal—condition called methemoglobinemia, a disorder in which the oxygen carried through the blood stream is greatly reduced. There are alternative and natural ways to help your baby manage the pain. The FDA suggests giving the child a teething ring that has been chilled in the refrigerator. Check out these 7 BPA-free, eco-friendly teething options from Inhabitots! Also, try gently rubbing or massaging the child’s gum with a clean finger, which can help soothe the pain. EDA member Dr. Veronica Bello of Avila Dental in Seattle also shares some great tips for taking care of your baby and young child’s teeth. Take a look at this helpful checklist and use it as a guide to keeping your baby’s mouth healthy while they work hard to develop their beautiful smile! Don’t share utensils with your child or put a pacifier in your mouth, which could transfer germs to your child. 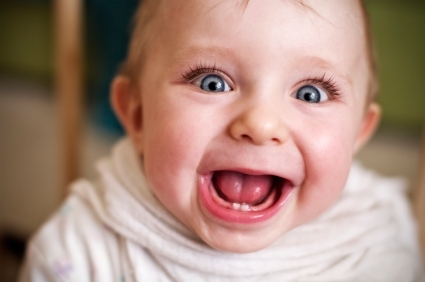 Until the teeth start coming in, wipe your baby’s gums with a clean, damp cloth. Never send your child to bed with a bottle! Once teeth start coming in, help your child brush with a child-size toothbrush and water. Avoid using fluoride toothpaste until around 2 years of age or as recommended by your pediatrician. Use a pea-sized amount of toothpaste between the ages of 2 and 6. Stay with your child when they brush until about age 6 or 7, or until you’re sure your child won’t swallow toothpaste. Promote healthy eating and encourage your child to drink from a cup by their first birthday. Remember, healthy habits start young! And while we always recommend consulting with your dentist on a personalized care option for your baby (did we mention we have a directory listing of eco-friendly dentists in 45 U.S. states and 16 countries worldwide who can help? ), let these tips ease your mind that you’re doing the right thing to help your baby achieve optimal oral health from the start!